Dr. Taft attended the College of Charleston, Charleston, South Carolina. He received his Masters of Art at the College of Charleston, Department of Physics in the early 1930's. He began working with radium in 1933 for medical treatments. He had lost a 75 mg sample of the material. Not sure where it was but realizing that the daily garbage was still on the premise, he check at the refuse site in the backyard. The radium was located in 15 minutes. He used an electroscope with a spark coil charger for his measurements. Dr. Taft worked with charging devices for electroscopes and various derivations as early as 1926. He responded to a request for locating a lost radium source in a doctor’s office. He used his electroscope and then after locating the source began improvements to his instrument. Radium is used in very small quantities for the treatment of medical diseases. The quantities were typically about the size of a quarter inch of pencil lead. These radium sources could cost as much as $12,000 each in 1938. His instrument became known as the “Radium Hound”. In 1944, Dr Taft was Professor of Radiology at the Medical College of Charleston. 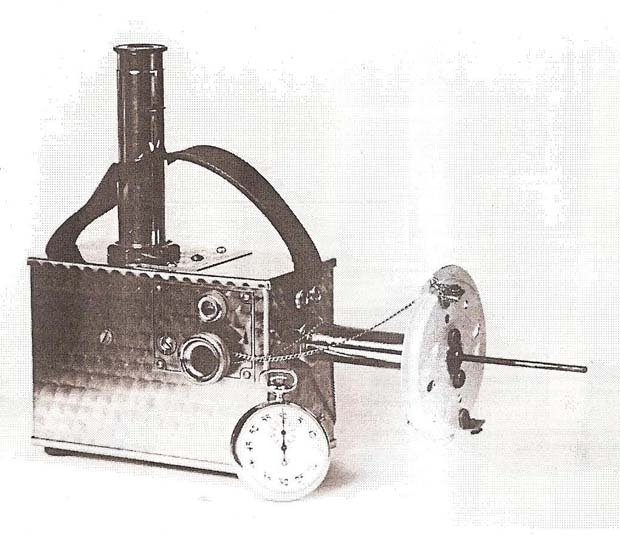 One of the earliest instruments for monitoring radium work was developed in 1934. The instrument consisted of a simple gold leaf electroscope with a charging device. The electroscope is mounted in a small glass flask about 4 inches high. The gold leaf is 1” x ¼” with a 2” cork fishing float coated with aluminum paint. It was determined that 1/13,000 R will produce a noticeable movement in the gold leaf. The instrument could hold its charge for "many hours or even days". When the instrument is brought near a radiation source, the gold leaf loses its charge. His research on the development of the Simple Radium Detector was published as part of his degree for a Masters of Art at the College of Charleston, Department of Physics. Dr. Curtis F. Burnam lost radium tube that was misplaced in hospital dressing. Using the electroscope instrument, the radium was discovered in a city dump. Dr. Albert Soiland lost 75 mg of radium. The patient slipped away from hospital and deposited radium behind soil pipes in a bathroom. It was located using the electroscope. In a second incident, 2 or 3 mg of radium was discarded with dressing and discovered in the basement of the building. J. L. Weatherwax lost 50 mg of radium in 1930 and was recovered in an ash pile which had gone through an incinerator using the electroscope. Others were lost which included 10 mg radium in 1931, 200 mg radium applicator in 1932, 140 mg applicator in 1935, 10 mg radium needle in 1935, 8 or 10 mg needles lost but crushed and dispersed, and a 50 mg applicator lost in 1932. 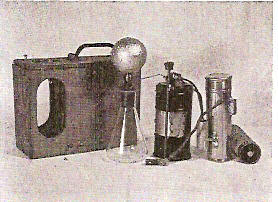 These were all located using either the electroscope or a later model geiger counter. Dr. G.E. Pfahler lost a 100 mg radium in 1931 and was located in the city dump. Dr. Otto Glasser lost radium salt in 1923 which was sent to a furnace. The ashes were examined indicating the radium had been scattered. 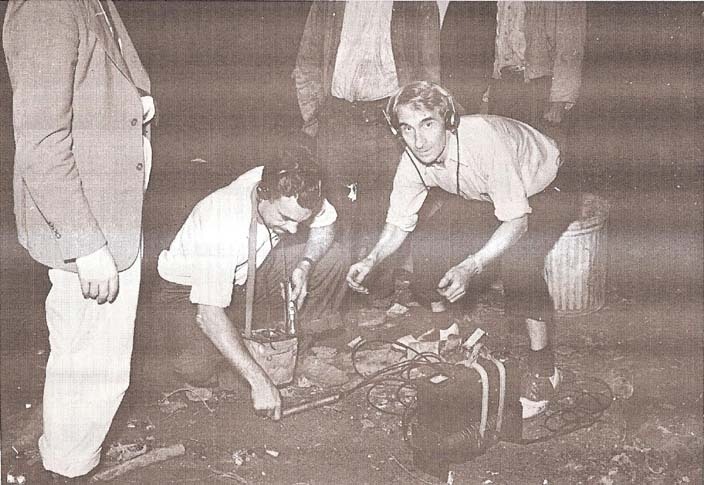 Radium tubes were lost in 1924 and located in ashes from a furnace with an electroscope. Ten radium needles containing radium salt were lost in 1927 when a patient left wearing a bandage containing the needles. The needles were found scattered on the floor of the hospital staircase. A 5 mg needle was lost in 1934 and found with a Victoreen r-meter and a radium emanation tube, lost in 1035, was located using a Victoreen proteximeter. The most amazing story of detector work took place in 1935. Two university staff, Dr. J. W. Buchta and Dr. H.H. Barber, of the University of Minnesota, investigated a lost radium source from Moe Hospital in Souix Falls, which was use to treat cancer. The radium was accidently discarded with an adhesive tape. The two went to the hospital with a crudely made golf leaf electroscope. They learned that the garbage was taken to a nearby pig farm. The electroscope gave a signal and then it disappeared. The owner of the farm decided to separate the pigs in groups since the garbage was their food. 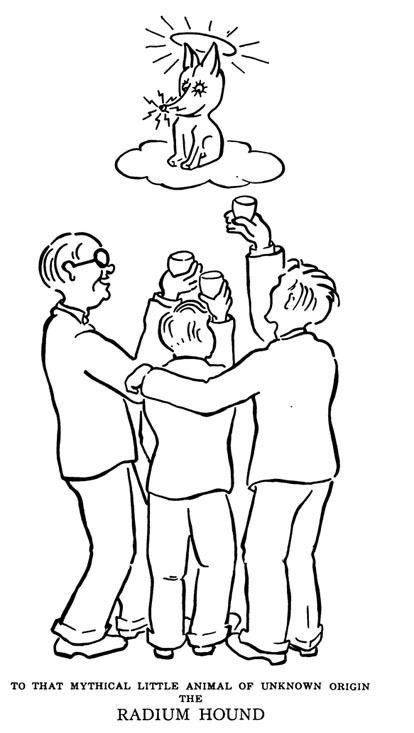 They kept dividing the pigs into smaller groups until they found the pig that ate the radium. It was determined to be a "solitary porker" and a butcher was called and the radium recovered. The early instrument used the “Stratosphere Tube” developed by Dr. Gordon L. Locher of the Bartol Institute. The unit was initially developed for cosmic ray determinations. It is a small glass tube filled with gas and operated at 750 volts. The unit was built into a wooden box for easy transport. 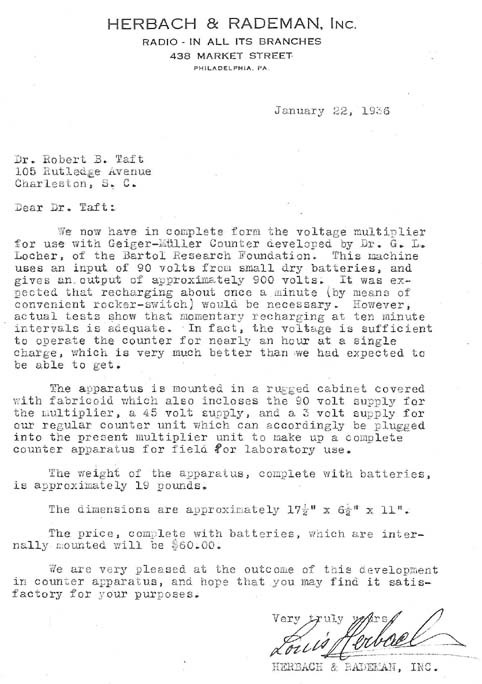 Dr. Taft developed a GM counter that operated on DC batteries. It used a Locher tube at 800 volts. 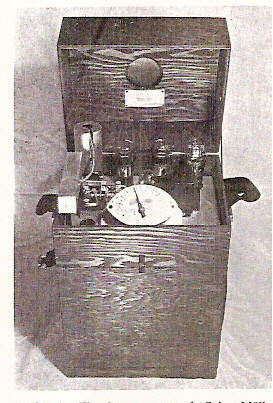 The early instrument was developed in 1935. It was an AC powered GM counter with a Locher tube. The Locher tube was in a metal shield can attached by a 6’ cable. The unit had a meter to show the voltage applied to the GM tube. A register on the front of the instrument recorded the pulses. A similar version was developed which operated on battery power. 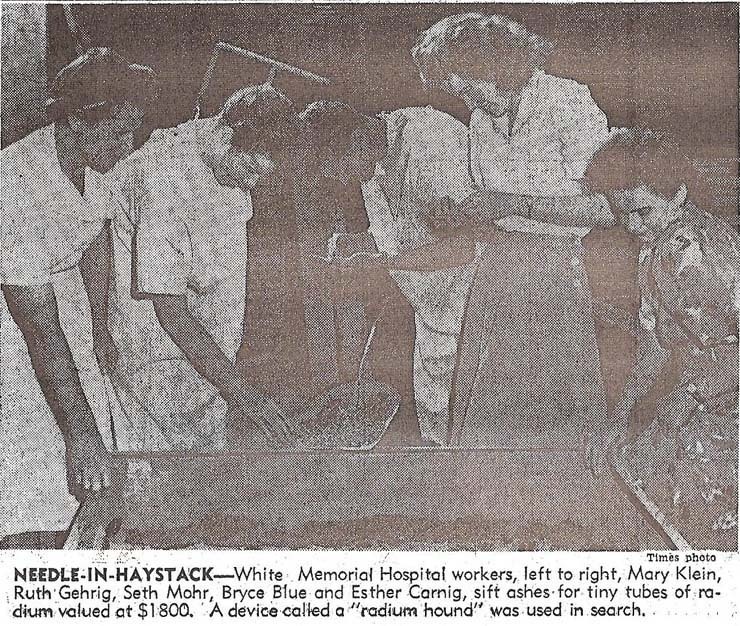 There was a need to leave the hospital setting where the radium was used and go to places where the radium may have been accidently discarded such as in the garbage and ending up in the city dump. As such battery power was needed and the batteries were stored in the bottom of the wooden box. 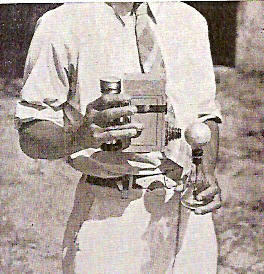 Dr. Taft conducted a series of range measurement for radium in air and water. The distance tests in air and water are presented below. It is evident that 50 mg radium could be detected at 200 feet in air and 70 inches in water. In addition to air and water, the radium was tested for detection behind various building materials which may be normally encountered in a search. It was tested for detection through 17 inch brick and submerged in water. It was also considered that the radium could be subject to theft. As such, it would be necessary to search the living quarters of the suspect. The counter could be placed in a car and used to search a typical house from the street. Dr. Taft concluded that "the idea of an instrument that can detect radium at long distances and through heavy walls is rather incredible to most persons, including many radiologists. For that reason, one who attempts to find lost radium may be the victim of many wise cracks and much concealed laughter. I find that the searcher will be much more respected if he will carry out this simple procedure: on entering the office of one who has sustained the loss, the searcher would say, Do not tell me whether or not you have any radium in your safe, or elsewhere in this office, because in two minutes I will find any that you may have". 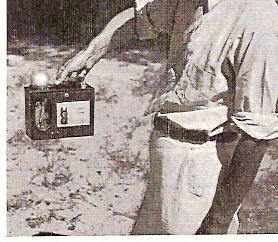 Dr. Taft also developed a battery-powered unit built into a wooden box. The unit had a small speaker signaling the pulses. 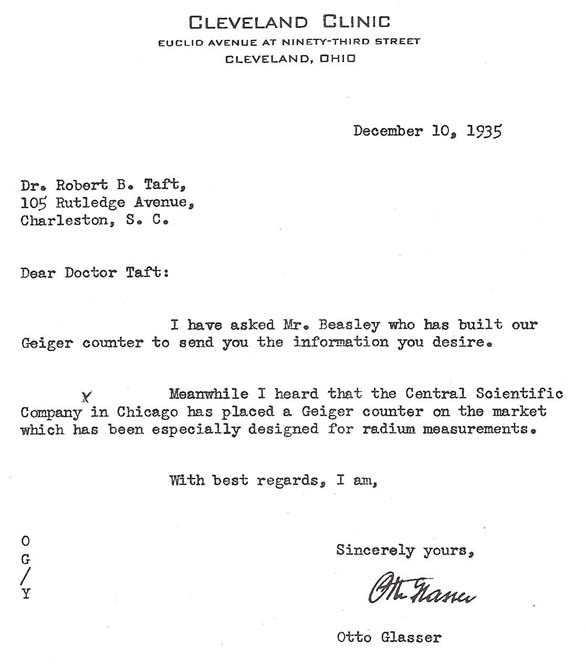 Dr. Taft spent considerable time characterizing his instruments for detection ranges for radium. 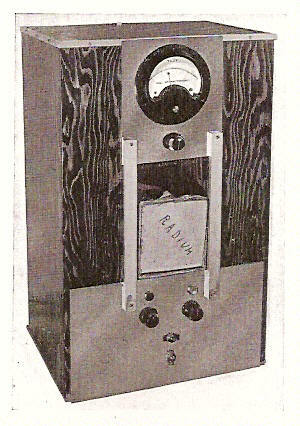 In 1935, Dr. Taft also used a Victoreen R-Meter with an external ionization chamber to locate lost radium. The chamber was constructed of two cookie sheets and a bread pan which is insulated with sulfur. The cookies sheets are suspended over the bread pan but not touching. The melted sulphur is used as the insulator. One aluminum sheet is attached to the body of the electrometer. The other sheet is connected to the middle of the unit which holds the thimble ionization chamber. In 1937, Walter Bosch presented information on a student type portable GM counter for cosmic rays and natural radioactivity. 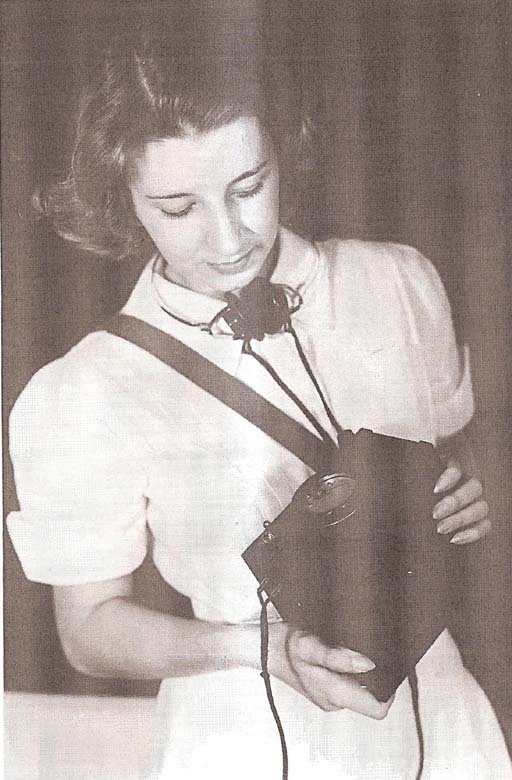 The unit was compact and portable and weighed 52 lbs. It was enclosed in a wooden box measuring 13” x 16” x 11” with front and back panels made of masonite. It used 20 batteries weighing 27 lbs. and giving 900 volts. It used a Locher type tube. 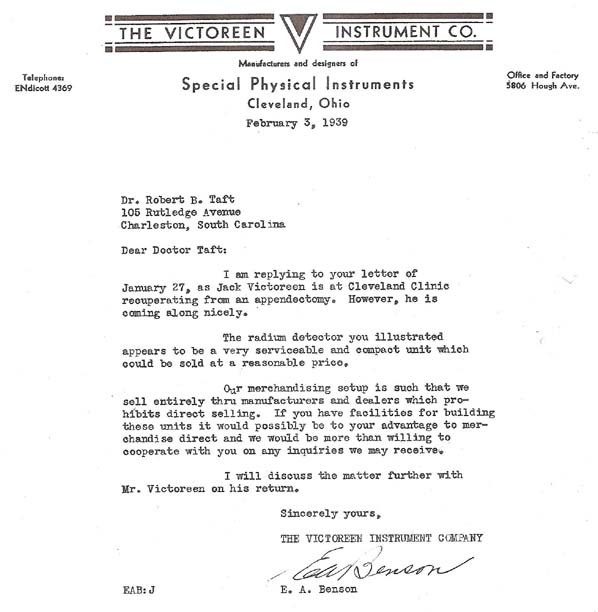 One of the early produces of x-ray measuring equipment was John A. Victoreen. 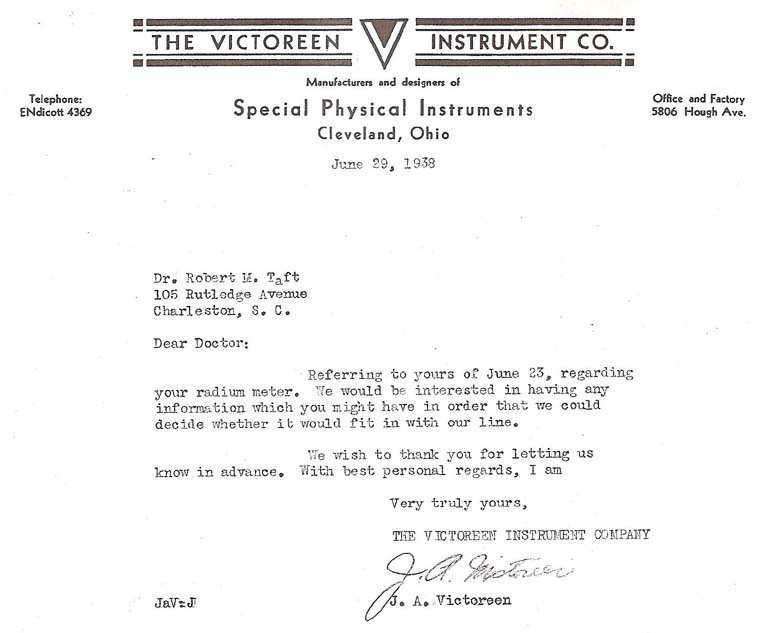 Victoreen was a self training engineer that was developing instruments for measuring x-ray radiation. 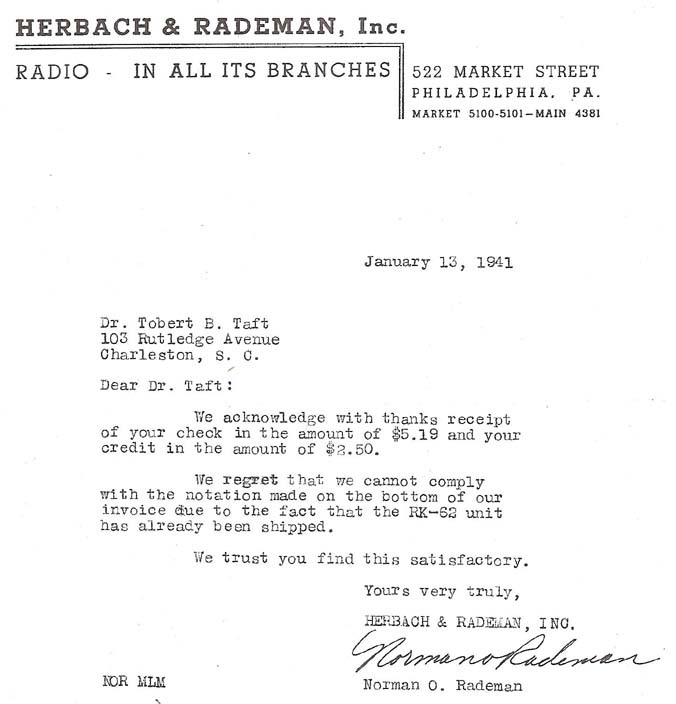 Herbach and Rademan also were developing radiation instruments in the late 1930’s. Dr. Taft worked with this company to further develop radiation measurement instrumentation. In 1939, Dr. Taft developed the Radium Quantity Meter to meet the needs of simple quantification of the radium in a therapeutic needle. The unit consists of a pair of ionization chambers and a readout calibrated in mg of radium. It had two scales 0-50 mg (red pilot light) and 0-100 mg (green pilot light). The colors were added because this instrument was meant to be operated by lab technicians. In the center of the instrument are the chamber which are made of tinned iron 0.010 inches thick and dimensions 20-1/4" x 9" x 3-1/2" and charged to 400 volts positive. There is a plate inside each chamber supported by amber posts. The two chambers are separated by plywood. During his career into the mid 1940’s, Dr. Taft provided assistance in 107 cases of lost radium. A newspaper article noted that “this curious material is calling out its presence continually, but it speaks a very obscure language that few men understand”. 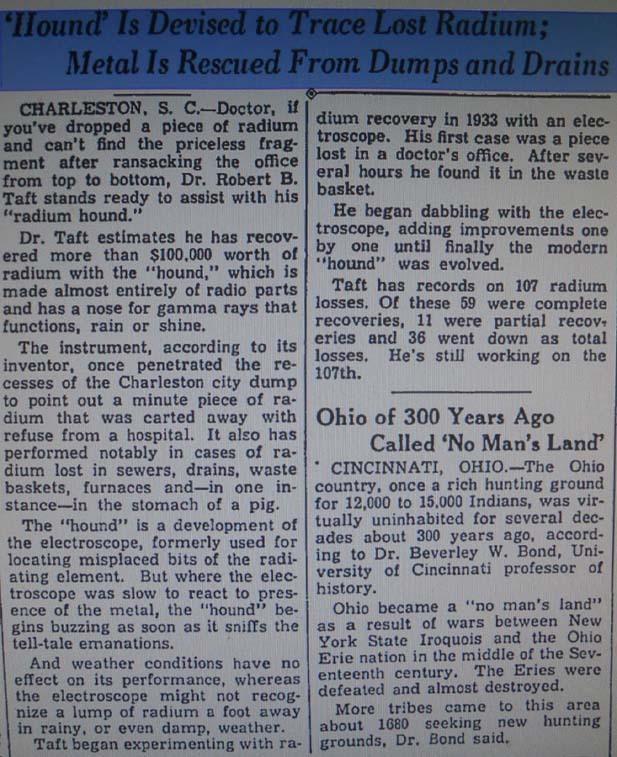 Dr. Taft published a book “Radium – Lost and Found" in 1935 outlining his experience with locating lost radium. He estimated that he has recovered more than $100,000 worth of radium up to 1938. He used the “hound” which was made of almost all radio parts. He has recorded 107 radium lose, 59 recoveries and 36 total loses. 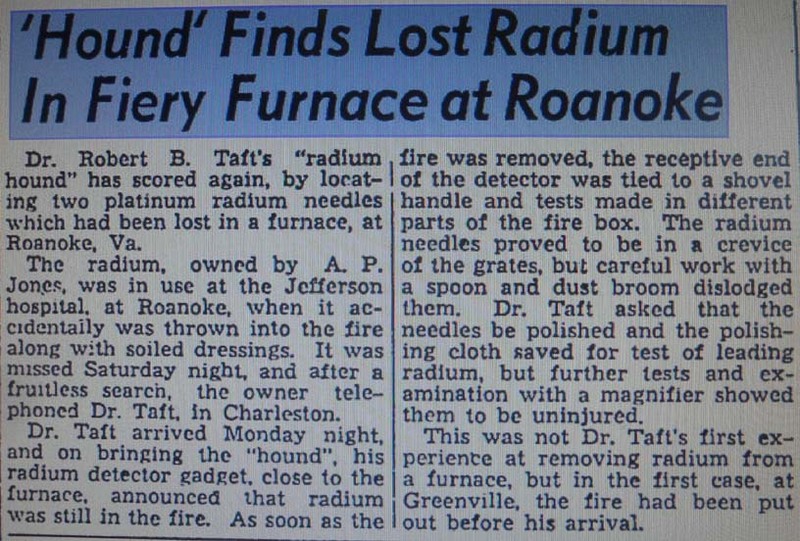 In the 1937, Dr. Robert M. Taft from 105 Rutledge Avenue in Charleston, South Carolina was a medical doctor who worked with the radioactive material radium. Radium was one of the few radioisotopes being used for medical treatments. 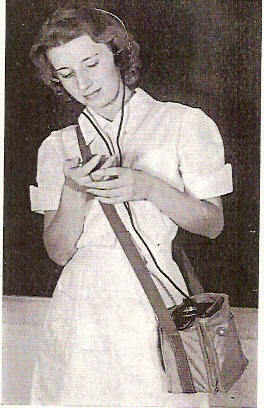 Radiation exposure was often used for cancer and other treatments. The radium was in the form of an insertable needle which could be placed near the skin or internally. Occasionally, the radium would be lost since it was typically relatively small. Unfortunately, radium was valued at $25,000 per gram in 1938. As a result, there became a need to periodically locate lost radium. One way to do this was to use a Geiger counter to measure the radiation signature from the radium. Dr. Taft modified available commercial instruments for this application and soon became nationally renown for his ability to locate lost radium using his “Radium Hound”. Dr. Taft developed a GM Counter in 1938 using the Locher tube. The tube was enclosed in a meatl shield and attached by a 6’ cable. The meter shows the tube voltage. Due to difficulties in regulating AC voltage, Dt. 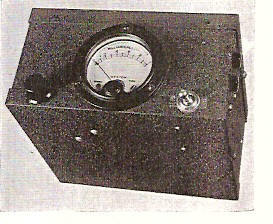 Taft developed at battery powered Geiger Mueller counter in 1936. It employed a Locher tube operating at 800 volts. It uses ninety volts of B batteries which were located in the bottom of the unit. It has a neon lamp to monitor pulses and a small speaker so the operator could monitor the radiation. In 1939, Dr. Taft published “Radium Hounds” in the Readers Digest. It was a condensed version of his Scientific American story. The was quite valuable selling for $25,000 per gram. The present United States supply was only 300 grams. The Portable GM counter from 1942 was completely contained in a steel box with dimensions 5-1/2" x 6" x 3" and carried in a canvas bag. The operated could operate the unit hands free and use a stop watch and tally counter to record the pulses. The sensitivity was defined as the doubling of the normal count when 50 mg of radium is located at a distance of 212 feet. IT employed two batteries of 1.5 volt and 67.5 volt. The normal life of the batteries is about 1 year. The GM counter was easy to use and portable. The operator would listen to the clicks on the headphones and record the pulses on a tally counter. In 1940, it was reported that airplane pilots were receiving lethal doses from the instrument panels in the aircraft which contained radium in order allow them to self-illuminate. Dr. Taft visit the Charleston Municipal Airport and checked a Lockheed Electra NC 14992. He started with the passenger compartment and found only background levels at 9 counts per minute. Then he went to the pilots compartment and put the instrument on the pilots lap and it read 93 counts per minute. A test was also conducted in a Douglas DC3 15598 and gave 103 counts per minute. It was determined that the pilot received a dose of 0.00012 R/h and considering a pilot flies 960 hours per year, the annual dose was 0.115 R/year. The accepted worker dose at that time was 0.1 R/day with out any health affects. 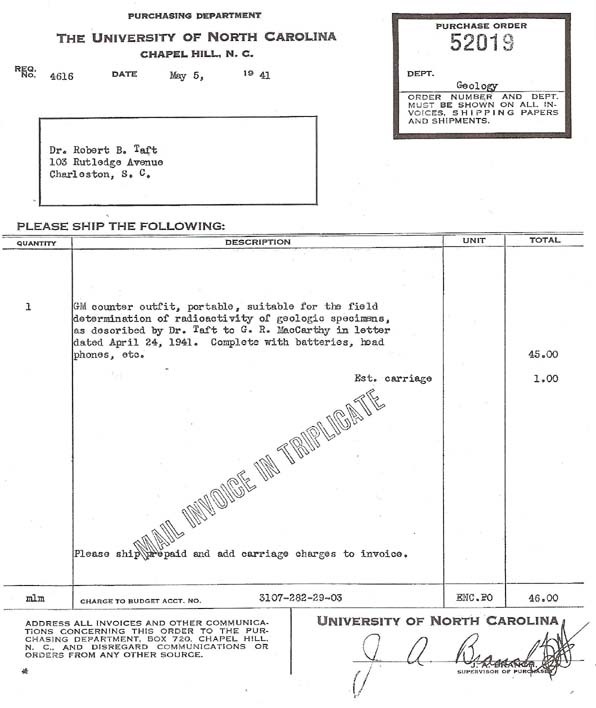 In 1941, Dr. Taft sold one of his GM portable unit to the University of North Carolina for $45. In 1942, Dr. Kenneth Corrigan of the Harper Hospital located $256,000 worth of radium in the few years since he began using it.